This morning we were up and in business casual before breakfast, PowerPoint in hand, and headed to downtown Grand Rapids. Our destination? The Kent County Board of Commissioners meeting – where we were first on the agenda! In honor of Sexual Assault Awareness Month, we presented to the commissioners about sexual violence among teens. We shared local and national statistics, discussed how to treat victims (help them be heard, don’t dismiss them), and stressed the importance of prevention. After our presentation, we opened the floor for questions. They asked about negative treatment of people on social media, to which we responded that social media is just the vehicle… what’s important is education for our youth that treating other people in this way is not acceptable. Multiple commissioners mentioned they were thankful for the chance to hear the presentation, with one noting it made her “hopeful for the future.” As long as our community is willing to confront topics like these head on, we’re hopeful too! 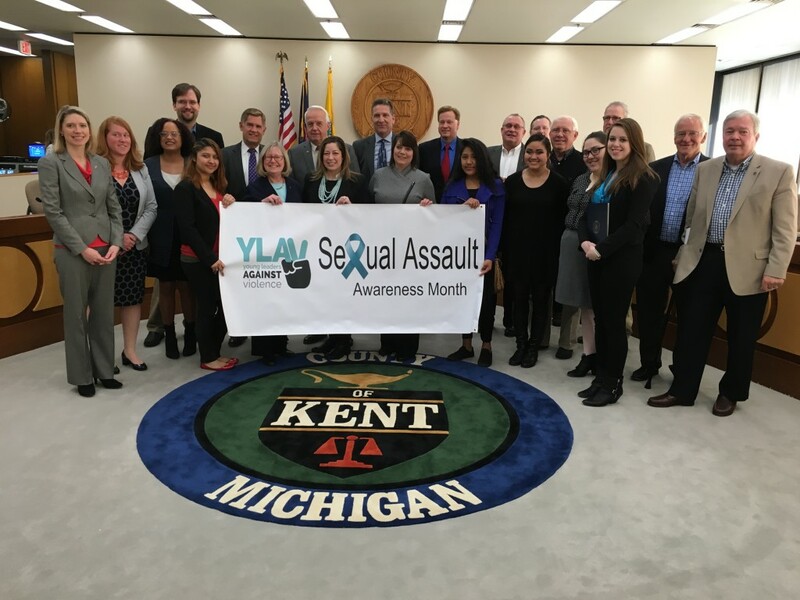 The commissioners then read a proclamation to declare April as Sexual Assault Awareness Month (which we got to keep). It was a great chance to build knowledge and awareness about an important topic, and we hope for more opportunities like this.